Hello, I have a Siamese cat named Simon who will be seventeen years old in June. He has Kidney Disease and we do monitor him frequently with Kidney Panels. His next check is this Friday. My concern is that he has gotten really sick the past two years from his yearly vaccinations. Last year was the worst. Finally, I demanded that the vet see him, and I took him in three days after his yearly vaccines. My cat was dehydrated and had to stay there for half a day to get IV fluids. After that incident, we found a new vet. He is almost seventeen years old? He already has Kidney Disease? He has gotten sick from the vaccines for the past two years in a row? When I first took Simon to the new vets', I mentioned this to them. They told me that they would probably give him one shot one day, then wait a few weeks and have me bring him back for the other shot. I really do not want him to have any shots at this point because I do not want to see him really sick again, but I'm not sure what to do. I don't want to harm my cat, yet I am afraid if I refuse to let them give him these shots, I am afraid that they will refuse to see him in their office. Can you please offer me any advice on what to do in this situation? I would greatly appreciate it. So sorry to hear Simon has been facing such challenges. Let me give you my opinion. I am not a veterinarian, but I do doubt the need to force vaccinations on a seventeen-year-old cat whose system is already compromised by a chronic illness. That said, yes, there are some vets who absolutely enforce the yearly vaccinations. This may be due to their own philosophy and/or your state regulations. Do you allow your cat to go outside? Do you have any other pets that go outside? Does your cat come in contact with anyone else's felines? If the answers to these questions are no, then I recommend you have a very frank discussion with your new vet and tell him/her you do not want to put Simon through another series of vaccinations, as long as you are not violating any laws in your area. Be very specific about his reactions in the past so your vet has the full picture. I do believe that breaking the vaccinations into two sessions is a step in the right direction if it turns out to be your only alternative. It wouldn't be quite as hard on your cat's system. If your new vet tells you it's office policy to give yearly vaccinations, but not law in your area, then you may need to search for another vet. 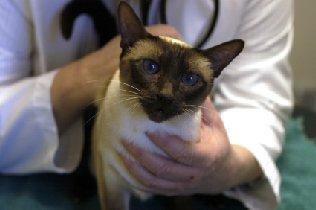 Have the discussion at the end of your cat's next kidney check up. This gives you the next few months before his shots are due to call vets in your area and find one who won't force the vaccinations, however, your new vet may be willing to respect your wishes. You won't know until you ask.